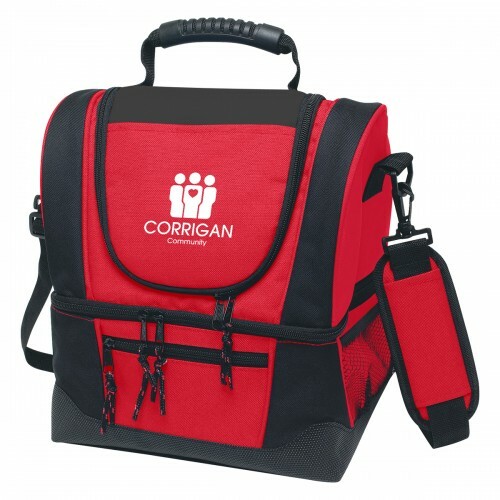 Customers will be impressed when you show up with this awesome custom cooler bag! 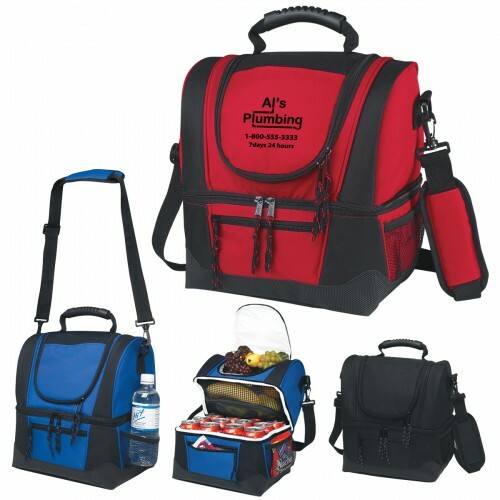 Made of 420D polyesterPEVA lining, this cooler bag is large and holds much more than your average cooler bag. Measuring 12" W x 13" H x 8" D, your logo will be front and center imprinted on the top pocket. Features included a double zippered upper compartment to hold snacks, with a double zippered lower compartment that holds up to 12 cans. A mesh divider keeps the compartments separated so you don’t have food and drinks in the same place. The front zippered pocket allows for additional storage, and the detachable/adjustable padded shoulder strap and web carrying handle have a comfortable plastic grip. 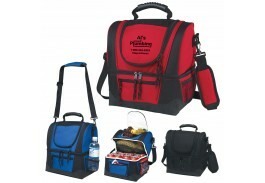 Choose from Red, Black or Royal Blue, all with Black Trim. Easy to care for, simply spot clean and air dry to keep your bag looking great.